In many lawsuits between workers and employers, disputes over whether the worker is an employee or contractor often arises due to the changing nature of work. More than ever are workers working contract to contract, able to work remotely, and have greater power to set their own schedule, creating the appearance of independence. The difference between employees and contractors is significant: employees are granted greater protection under legislation and by the courts than their contractor counterparts. This distinction makes the fight over worker status a potentially costly endeavor with a worker’s entitlement varying greatly depending the outcome. Under the Canadian Labour Code (“CLC”), a terminated non-managerial “person” who has been employed for over twelve months may file a complaint for unjust dismissal. The definition of ‘person’ within this section of the CLC has been contentious, particularly on whether it applies to dependent contractors, along with employees, to file a complaint for unjust dismissal. In Peepeekisis Cree Nation No 81 v Dieter, 2016 FC 1257, (“Dieter”) the adjudicator was tasked with determining whether an dependent contractor is entitled to the Unjust Dismissal remedies under Part III, section 240 of the CLC. 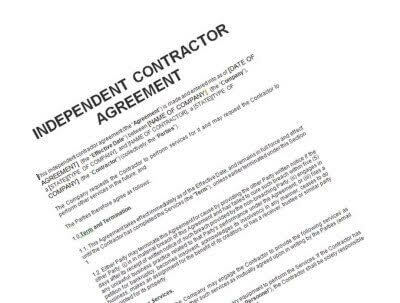 While a dependent contractor is included in the definition of employee for the purposes of Part I, no similar provision is provided in Part III. The adjudicator determined that the contractor was a dependent, instead of independent, contractor and that he was entitled to a remedy under the Unjust Dismissal regime, in the same manner an employee would be. The dependent contractor was provided with damages representing the balance of his fixed term contract. Based on Dieter and other similar cases at the federal level, the dispute between contractors and employees is still an unsettled area of law both in the courts and tribunals of Canada. Improved Legislative Protections in Ontario? As of the writing of this post, the Ontario Government has introduced Bill 148, the Fair Workplaces, Better Jobs Act, 2017 and has gone through its first reading through the legislative assembly. If passed, this new bill would provide additional protection to workers that straddle the line between employee and contractor. Under the proposed amendments to the Employment Standards Act, 2000 (“ESA”), an employer shall not treat a person who is an employee of the employer as if the person were not an employee. If the employer wants to allege that the worker is a contractor and not an employee, the burden is on the employer to demonstrate that the person is in fact a contractor. This is in contract to the current state of the law, where the onus is on the employee to lead evidence that they were employees. This proposed amendment would effectively create a presumption that a worker is an employee until otherwise proven and provide greater protection for both dependent and independent contractors. With the many changes occurring now in employment law with the recent release of the Changing Workplaces Review in Ontario and proposed amendments to the ESA, it is important to seek the best advice to see how they can affect you as a worker or as an employer. Contact Monkhouse Law today for a free 30 minute consultation!